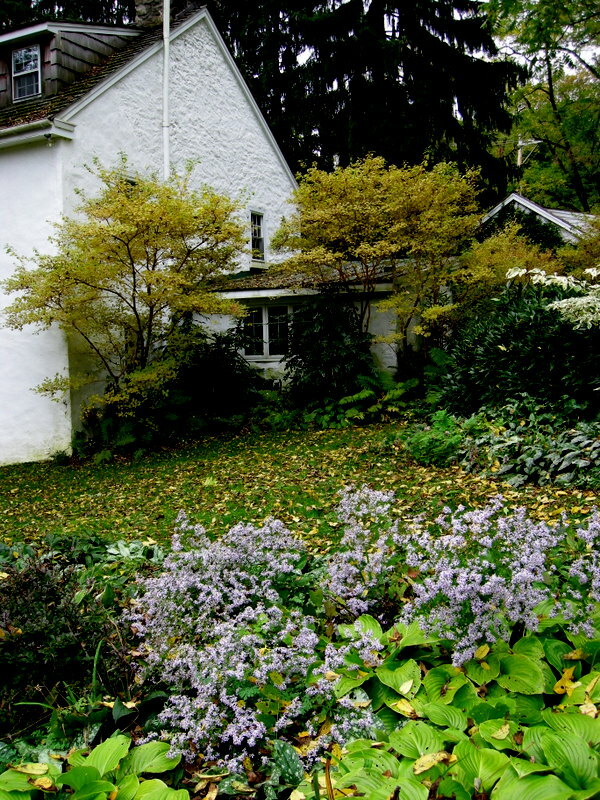 I recently had the privilege of visiting Brandywine Cottage, the house and gardens of horticulturalist and author David Culp. 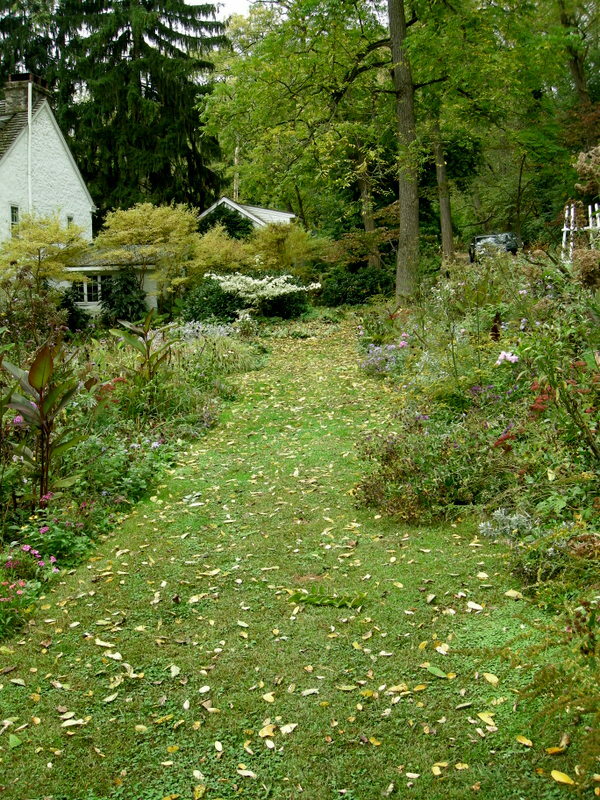 I have toured these extraordinary gardens many times over the last 20 years, but always in the winter and spring as David and I share a passion for (or should I say obsession with) snowdrops and hellebores. 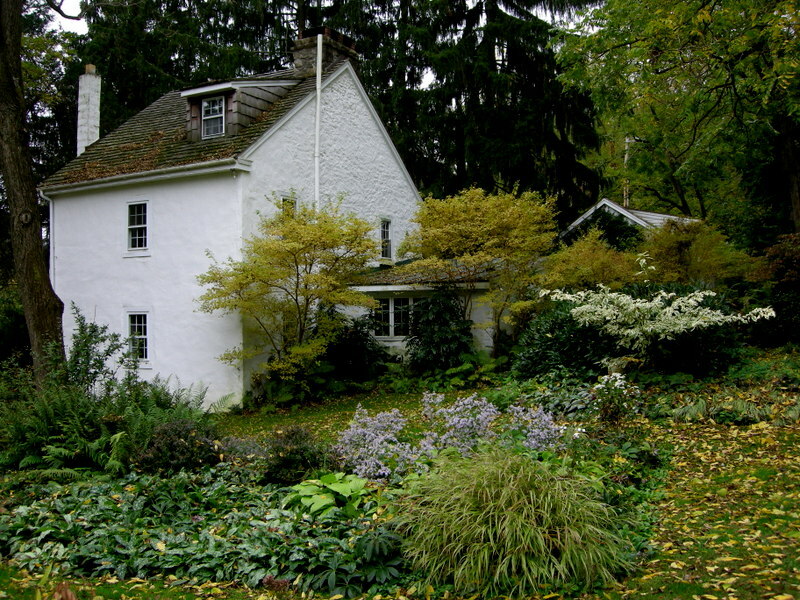 The arrival of a special shipment of snowdrops from England gave me an excuse to make the trip and experience Brandywine Cottage in October. 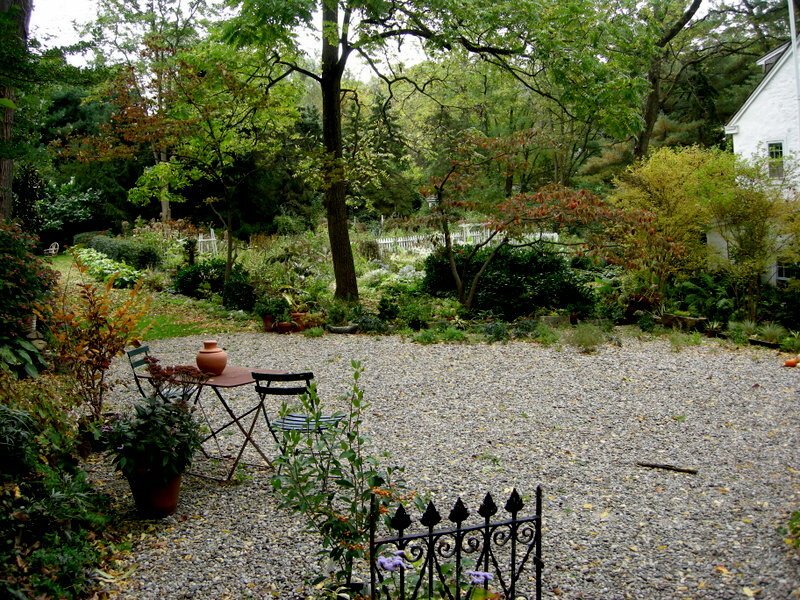 Looking down on the gardens from the driveway. 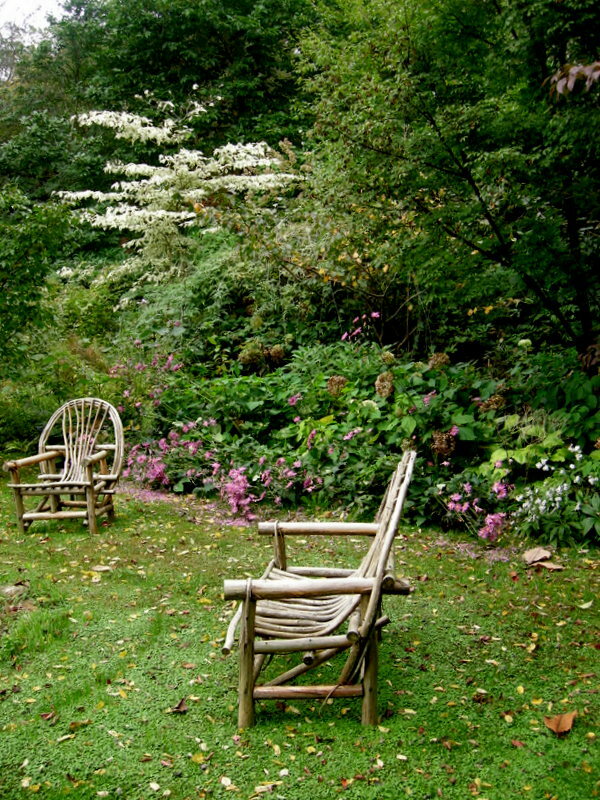 Among his other accomplishments, David Culp is the author of The Layered Garden: Design Lessons for Year-Round Beauty from Brandywine Cottage (Timber Press 2012). 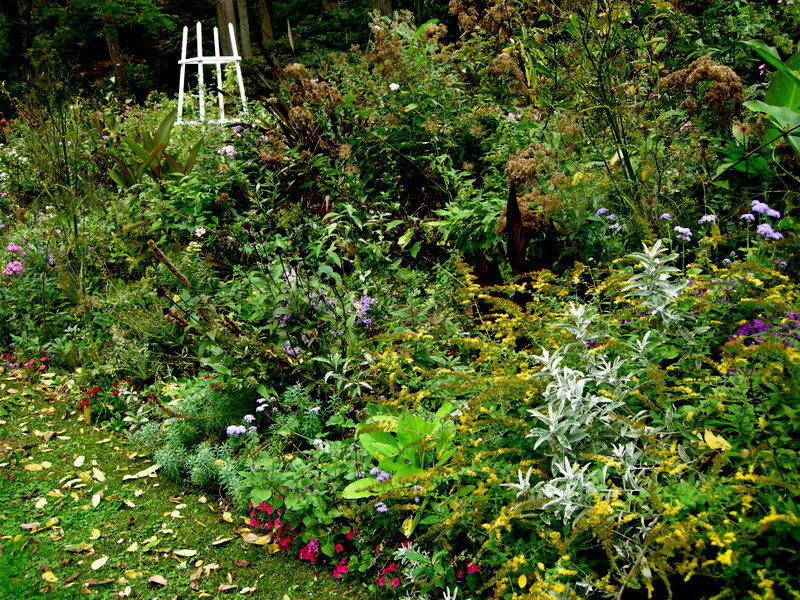 The Layered Garden recently received the 2013 Gold Award from the Garden Writers Association for Best Overall Book. 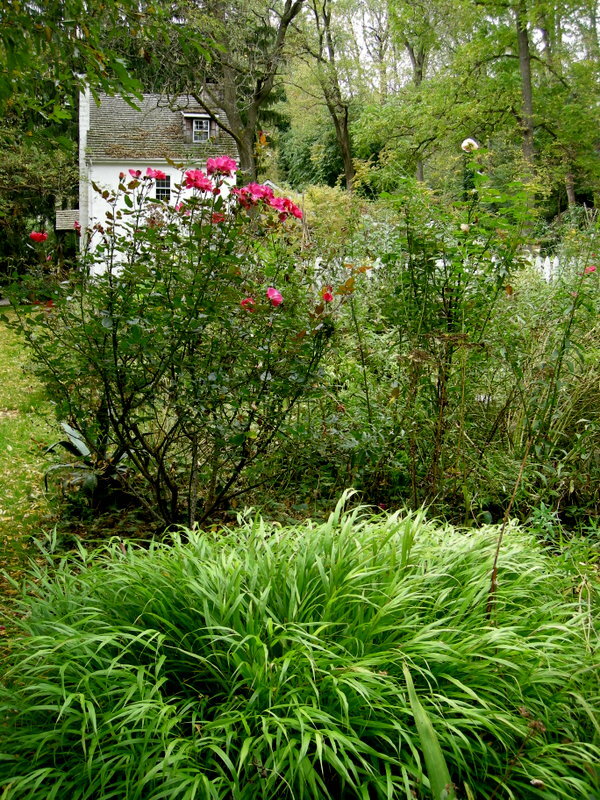 For more information on this wonderful book detailing David’s approach to garden design, his passion for plants, and the development of Brandywine Cottage over the last 20 years, click here. 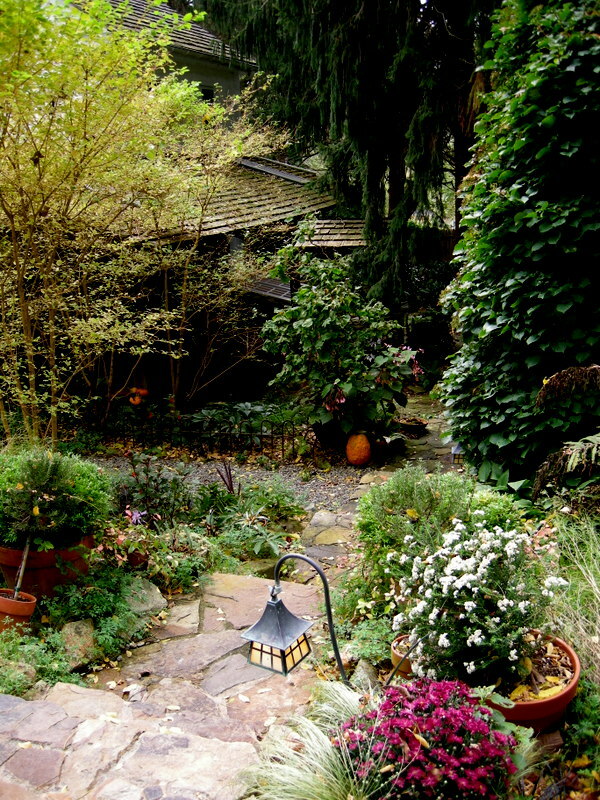 Fall is a difficult time to view a garden in southeastern Pennsylvania. 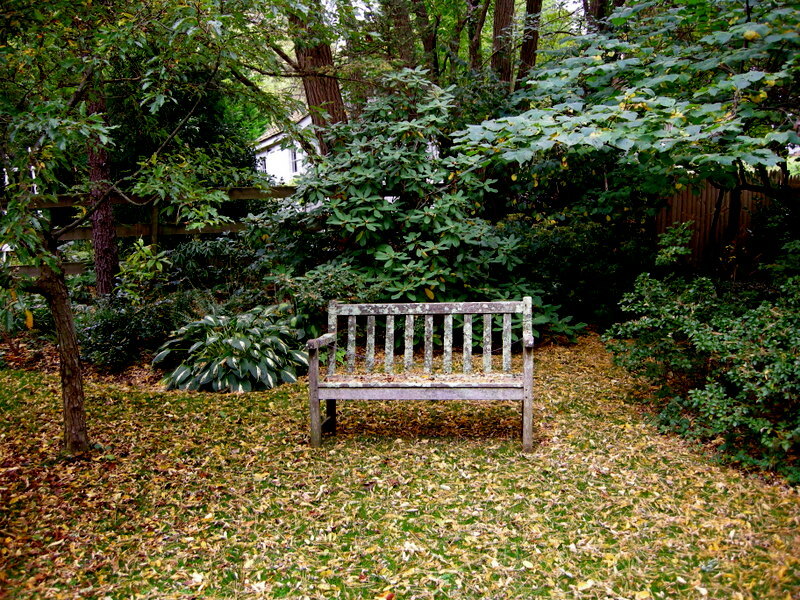 The leaves are falling off all the huge trees, obscuring the beds and detracting from the perfection we can achieve in spring. The wonderful plants that might provide some lovely close up shots are eaten by insects, browned by drought, and beaten down by torrential rain. 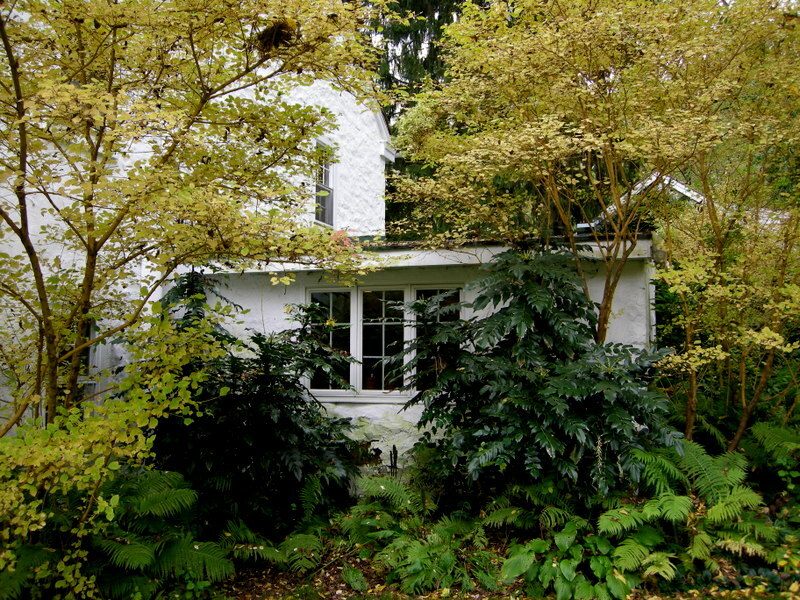 However, a well-designed garden like Brandywine Cottage highlights the subtle beauty of fall. It was still a pleasure to visit even on an overcast and dreary day with more heavy rains threatening. I hope you enjoy your virtual trip through this special place. 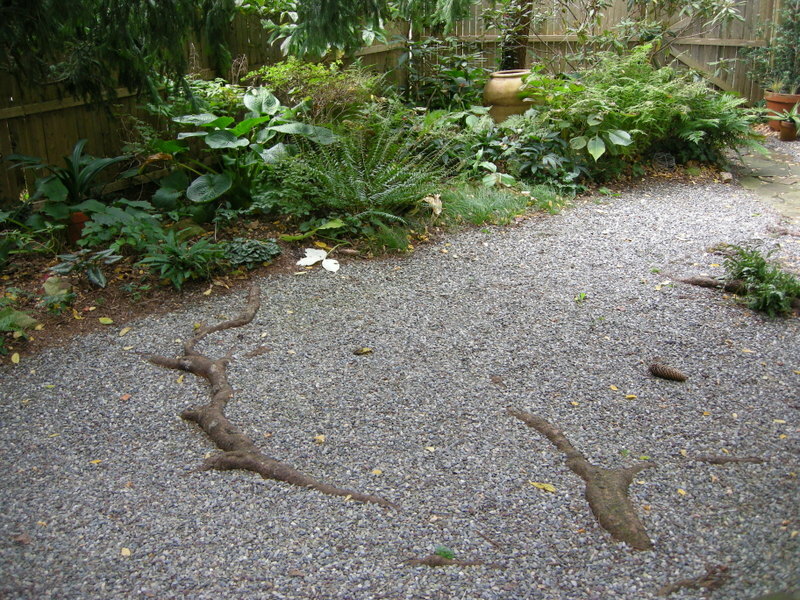 A courtyard by the front entrance is shaded by a giant Norway spruce whose roots make an interesting pattern in the gravel. David has several edgeworthias thriving in full shade. 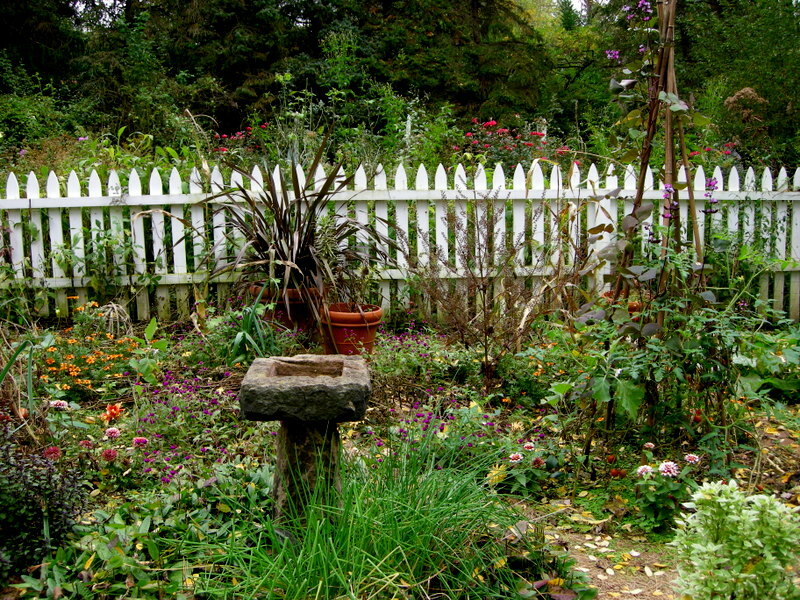 The vegetable garden with its white picket fence is on the left and the largest perennial border is on the right. 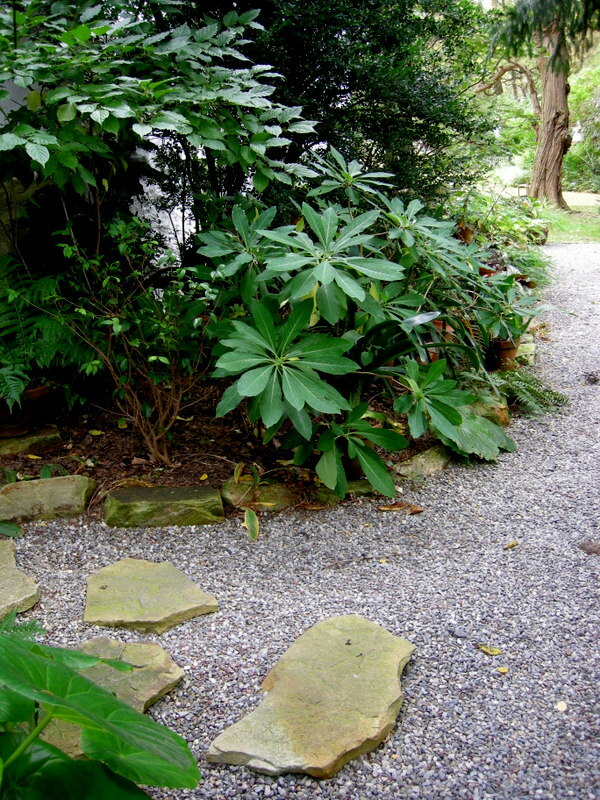 Narrow paths crisscross the hillside above the house which is filled with shade plants, including hundreds of hellebores. 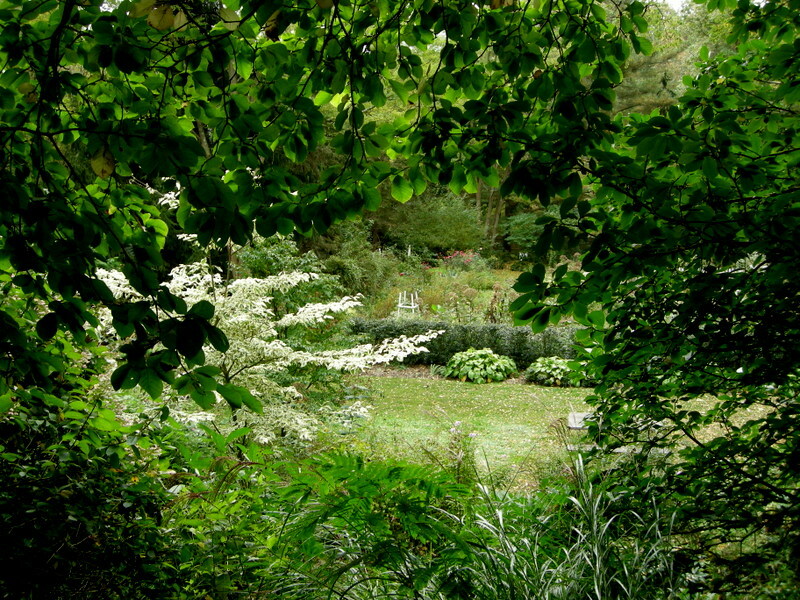 An opening through the trees allows a view from the hillside towards the gardens below. 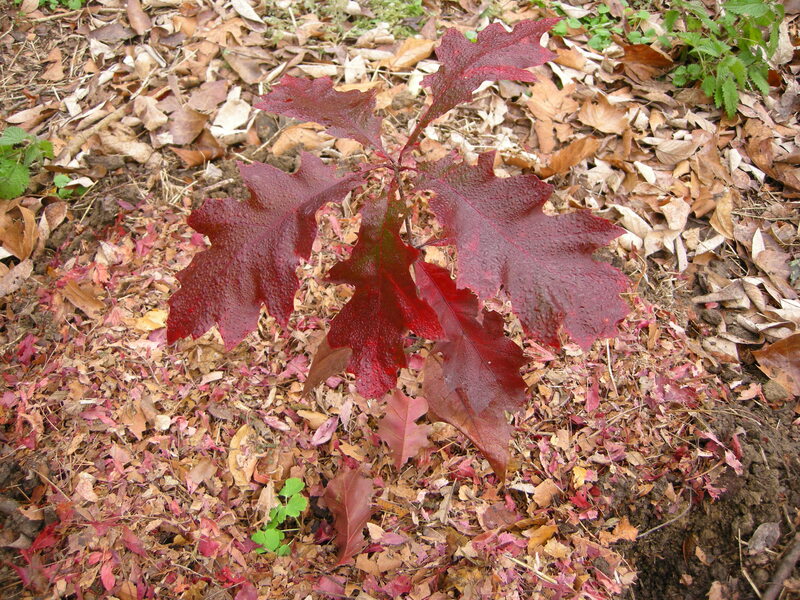 You are probably wondering why I posted this picture of a red oak seedling that looks like Charlie Brown’s Christmas tree. It’s because this tree is the beginning of the oak forest that we are planting after reading Doug Tallamy’s book Bringing Nature Home. 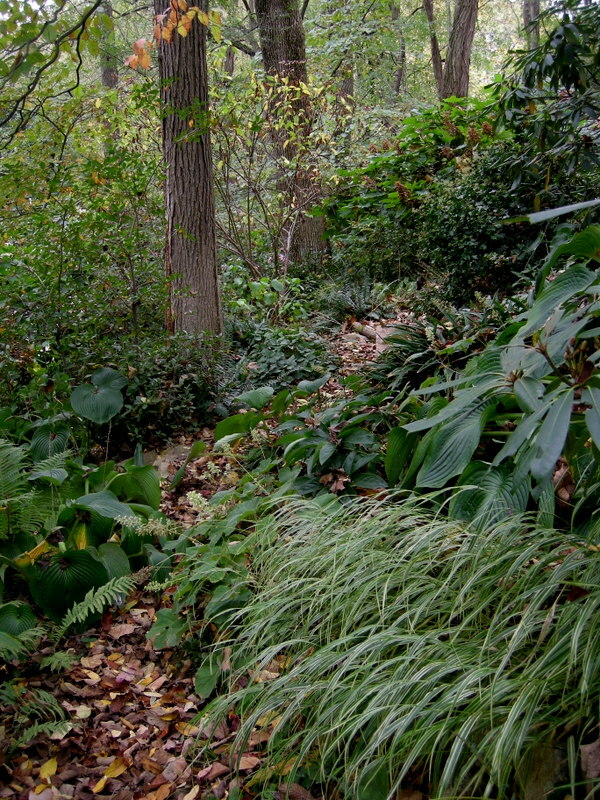 In fact, I think we will name this new area of our gardens the Tallamy Copse in honor of the person who is doing the most to alert this country to the silent crisis facing our native plants and animals, and us. Doug Tallamy, Chair of Entomology and Wildlife Ecology at the University of Delaware, finally made me understand why native plants are crucial to our survival on this planet. Yes, being a somewhat evolved horticulturalist, I knew native plants were desirable. But I thought it was just because they were native and better adapted. And the native plant movement really turned me off with its insistence on exclusively native plantings, not even approving of native cultivars. But it was Tallamy’s simple and insightful analysis that brought the whole problem into focus. According to Tallamy, research shows that removing 95% of our land from nature will result in the extinction of 95% of the species that live there. The result for Pennsylvania right now is dire: 800 plant and animal species listed as rare, threatened, or endangered, and 150 gone for good. And, in case there were any doubts, biodiversity is what keeps us humans alive by generating oxygen, cleaning water, buffering extreme weather, recycling our garbage, etc. What to do? Tallamy identifies the answer as planting native plants to support native insects and allow them to pass biomass up the food chain. 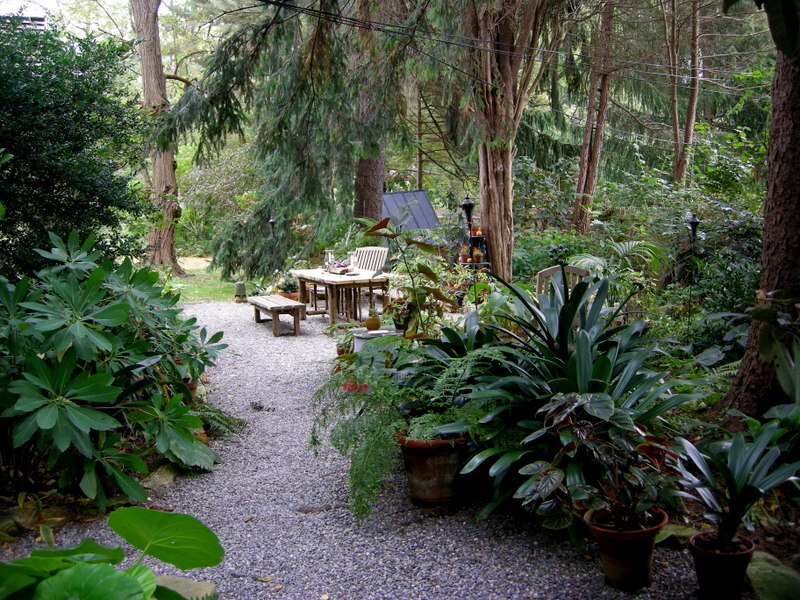 The plants must be native because of their shared evolutionary history with native animals. 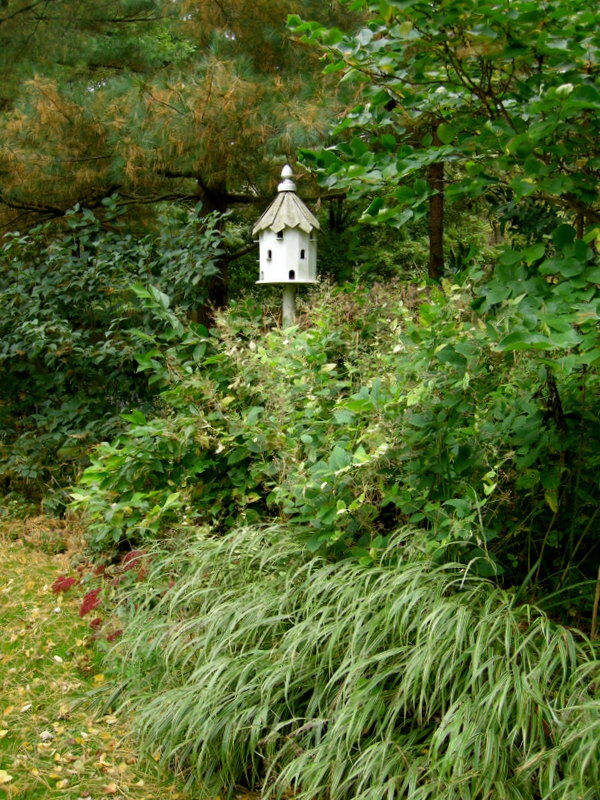 Native insects do not eat non-native plants. For example, Kousa dogwood supports no native insects, while our native dogwood supports 117 species of moths and butterflies alone. That’s where my red oak grove comes into play. At a lecture I attended, Tallamy stated that if you were only going to do one thing, then plant an oak. Native oak trees support 534 species of butterflies and moths. 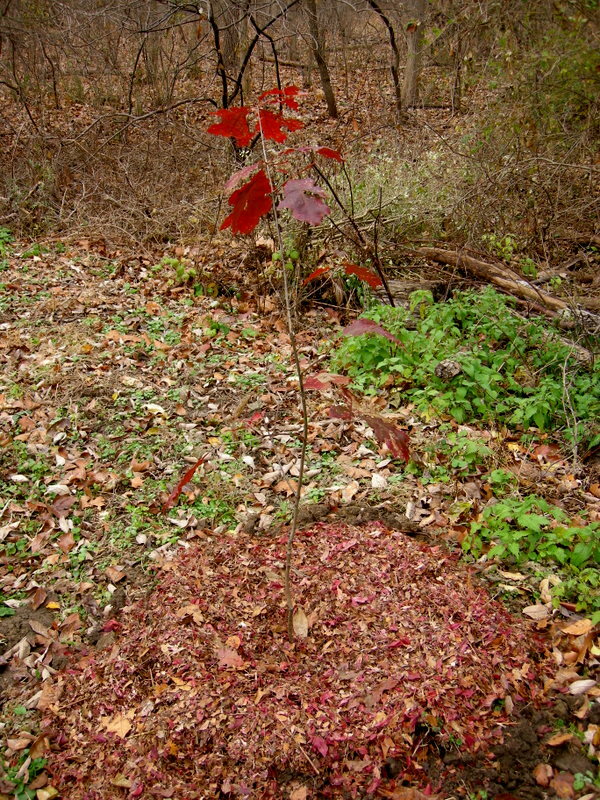 For Thanksgiving, my husband cleared out an area at the bottom of our property that was filled with Japanese knotweed, goutweed, lesser celandine, privet, bittersweet, multiflora rose, Norway maples, and burning bush—none of it planted by us—and moved five oak seedlings there. It is the beginning of a native forest, and the only way I can deal with the enormity of what Tallamy has so eloquently described. I hope you will join me by planting your own oak. 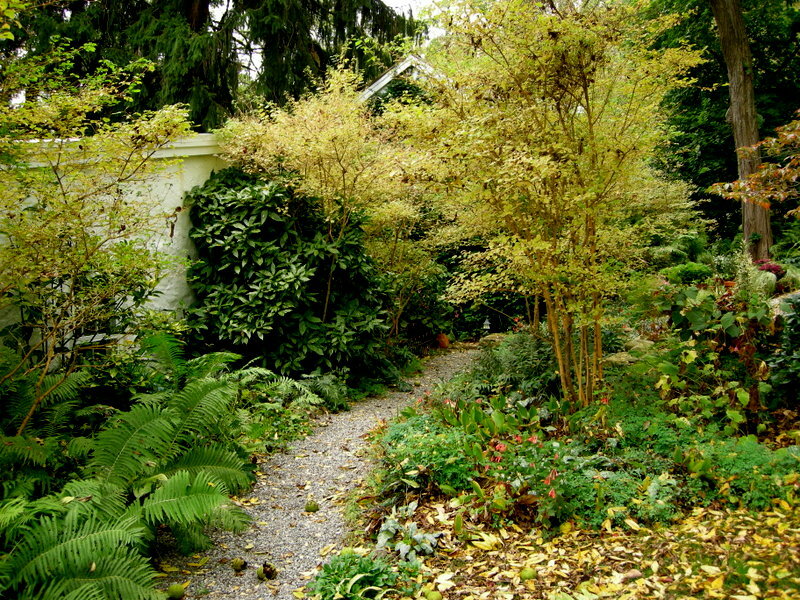 The statistics above are mostly paraphrased from a September 2007 article written by Tallamy for the Hardy Plant Society: Mid Atlantic Group (a great group of people who love plants—check out their website). His book Bringing Nature Home is a must read, and his website has great information too. If you ever get a chance to hear him lecture, take it—he’s excellent. 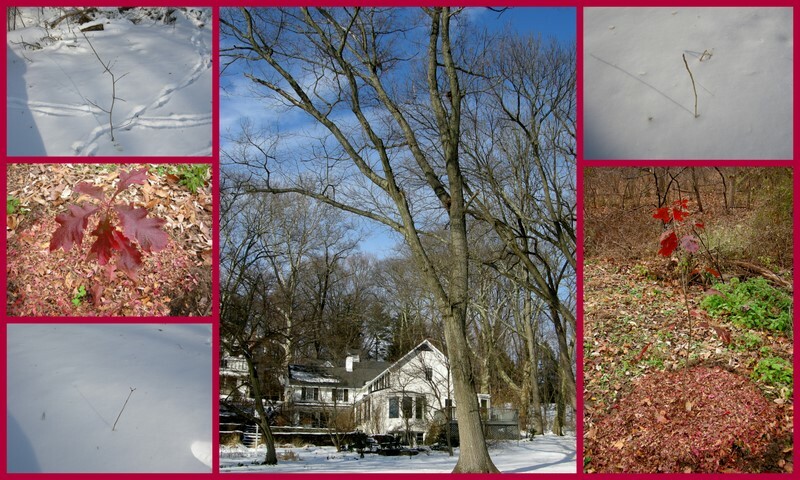 This collage pictures the five native red oak trees my husband planted plus the mother oak. December 30, 2010.